Top Caribbean honeymoon destinations aren’t always just for lounging on the beach – take a walk on the wild side and enjoy romance, adventure and pampering in these rich, tropical environments. A lounge chair and frozen cocktails may be essentials for those honeymooning in a beach destination, but if you’re the type that likes to get a bit more adventurous, you’re in luck. These top Caribbean honeymoon destinations boast lush rainforests and tropical jungles in addition to gorgeous beaches. In these nature-rich places, you can take a walk on the wild side — literally. Hike amid tropical foliage to waterfalls, zipline above mango trees and swim in sulphur springs beside an active volcano. Here’s where to climb to new heights in some of the top Caribbean honeymoon destinations. Tucked beneath Mexico, this small Central American country has the world’s second largest barrier reef, attracting snorkelers and divers. It’s also home to a rich Mayan history with fascinating stone ruins set in remote corners of the jungle. On day-long tours of Caracol, the largest Mayan site in Belize (rediscovered in 1937), you’ll explore its central pyramid-shaped temple called Caana (or Sky Palace), which rises 135 feet, excavated tombs and other unique Mayan structures. Marvel at the natural beauty in the Mountain Pine Ridge Forest Reserve, Belize’s oldest national park. First stop is 1,000 Foot Falls, Central America’s highest waterfall, followed by a visit to Rio Frio Cave, an ancient Mayan place of worship with stalactites and stalagmites. 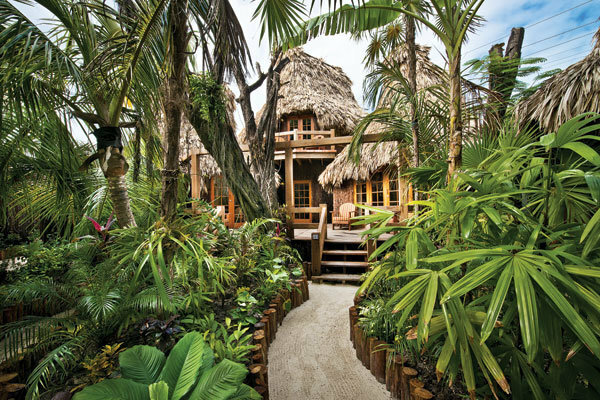 Owned by Oscar-winning director Francis Ford Coppola, Blancaneaux Lodge is a luxury 20-room jungle outpost in the Cayo District. 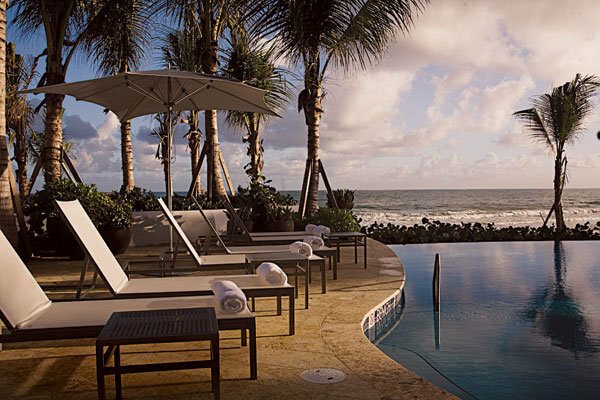 After a day climbing up Mayan ruins, treat yourself to a Thai massage in the spa and sip wine from Coppola’s vineyard. Hit the beach at Ramon’s Village Resort, a Polynesian-style resort with thatched cabanas on the nearby laid-back island of Ambergris Caye. All-inclusive resort areas like Punta Cana in the south and Puerto Plata in the north make a DR beach getaway super easy. However, the country’s interior offerings are just as rich. Be sure to explore the island’s national parks, replete with historic caves, Taino Indian sites and colorful tropical butterflies and birds. National Park Del Este near Punta Cana skirts the coast and boasts inland jungle terrain. Eco-tours take you to the remains of Taino Indian sites and unique cave systems including Cueva de Chicha with a large underground lake (check out the petroglyphs at the entrance). A Chavon River cruise through the jungle gorge in a traditional thatched-roof boat is another popular outing. On the northern coast, near Puerto Plata, you can zoom across the jungle valley on a zipline tour in El Choco National Park, which is also home to caves and lagoons that attract hikers and bikers. It’s hard not to have fun at the all-inclusive Hard Rock Hotel & Casino. Splash poolside (love those waterslides and underwater tunes piped in), dine in one of 10 restaurants, including a steakhouse, and party on in the club and casino. There are even guitar rentals for the rock ‘n rollers. The posh Casa Colonial in Puerto Plata has stylish rooms with beautiful four-poster beds topped with Frette linens, and a rooftop infinity pool. 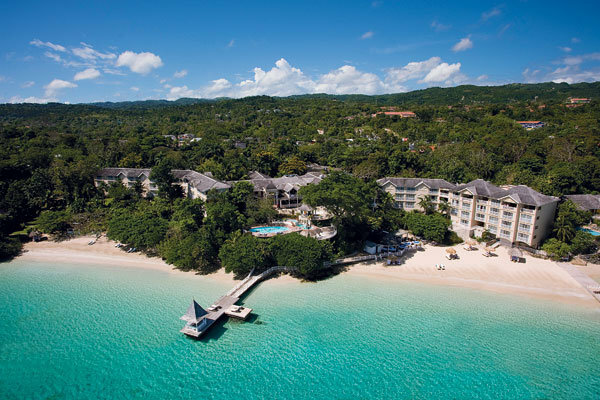 Negril and Montego Bay are top beach resort areas, but this chill-out island also boasts a lush interior with mist-laced mountains and endless coffee plantations. you can find many of these sights near Ocho Rios on the northern coast. And don’t worry, mon, no matter where you are, reggae and a Red Stripe are never too far behind. In Mystic Mountain Adventure Park, take a chairlift past fruit trees and tropical birds to the summit. Then enjoy an exhilarating zipline tour across the rainforest canopy. Another must-do is a trek up Dunn’s River Falls, a series of waterfalls that drop a total of 695 feet. In the mystical Blue Mountains, biking tours take in the area’s exotic flora and fauna, fruit farms and coffee plantations. The exclusive Strawberry Hill, high in the Blue Mountains, has just 14 colonial-style cottages. After a day hiking to remote villages, kick back in the infinity pool with heavenly mountain views or take a nap in one of the hammocks. Unwind at the beautifully manicured Sandals Royal Plantation (as seen on the Bachelor fantasy suite week with Ben Higgins!) 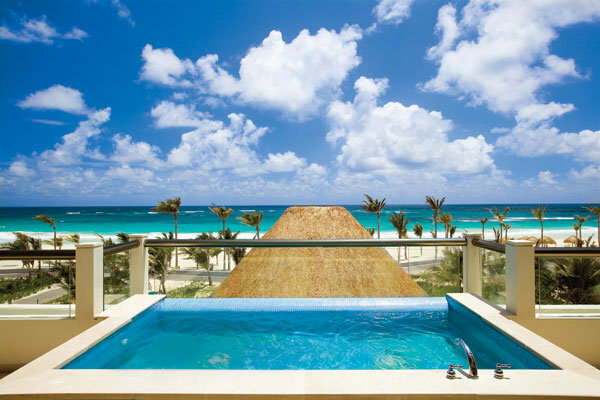 an all-butler, 74-suite beachfront resort with luxury perks like scuba diving, candlelight dinners, couples’ spa treatments such as coffee wraps and hot stone massages, in addition to the island’s only caviar and champagne bar. A honeymoon in Puerto Rico is a cinch — English is widely spoken, U.S. dollars are accepted and the island is serviced by loads of non-stop flights. In addition to fab beaches, a sizzling nightlife and historic Old San Juan, there are rainforest adventures that will satisfy thrill-seekers. Replete with plenty of lush foliage and cascading waterfalls, El Yunque, about an hour’s drive from San Juan, is the only tropical rainforest in the U.S. National Forest system. All levels of hiking trails crisscross the 28,000-acre park. One of the most popular paths is La Mina, which winds up at beautiful La Mina Falls (the reward is a refreshing dip, so be sure to wear your bathing suit). Along the way, keep an eye out for animals found only here, including the coqui tree frog and the Puerto Rican parrot. In the heart of Old San Juan, with its Spanish colonial buildings and cobblestone streets, Hotel El Convento is a 17th-century convent-turned-luxury boutique hotel whose 58 rooms feature wood-beamed ceilings and wrought-iron chandeliers. The courtyard houses a popular tapas bar. If you prefer to stay right on the beach, check into La Concha Resort, with 485 rooms and a 24-hour casino, located on a prime waterfront stretch in the hip Condado district.